The TAG Heuer Formula I CAH101A.BA0860 timepiece is part of a series that strives to live up to its name. As implied by its title, the watches in the Formula I series are elite and high performance devices that also epitomize the style and elegance that TAG Heuer is known for. The Formula I CAH101A.BA0860 comes with a host of features that will make timepiece connoisseurs swoon. 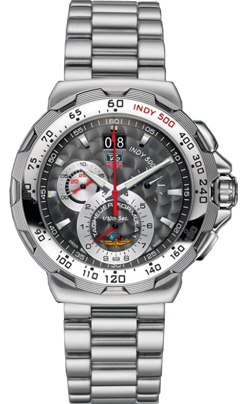 Prominently featured on the bezel–in addition to the time counters–is the signature “Indy 500” title of the watch in a striking red color that references the power, reliability, and high end performance associated with the Indy 500. The bezel itself is made of fine-brushed steel for maximum security. And as with all TAG Heuer timepieces, the surface of the dial is made of sapphire crystal, providing scratch resistance from everything besides diamonds themselves. As you can see from the photograph, the watch is quite the eyeful. With chronograph counters at the 6 and 9 positions, grand date display below the 12, and a small second counter at 3 in addition to the main hands in the dial, it is a very busy timepiece. Some who value a simple and elegant style may find this approach a bit off-putting, but for those who are drawn to complex timepieces, the Formula I CAH101A.BA0860 will be love at first sight. The chronographs that are appropriately sized at the 6 and 9 positions of the dial are accurate to 1/10 of a second, making them fit for timing the Indy 500 themselves. The movements are powered by quartz battery that TAG Heuer promises only the best performance from. The battery supposedly has a service life of about two years, but wearers should keep an eye out for the end of life indicator built in to the timepiece. When the battery begins to show signs of weakness, the second hand will start making four-second jumps every four seconds. It will remain accurate until it has run out of power completely. Water resistance as deep as 200m. Screw-in crown with easy grip system and double gaskets. Faceted hands with luminescent markers. Minor condensation developing on the crystal of the watch when exposed to sudden temperature changes. Water resistance is not a permanent condition. It is recommended to ensure that the seals are in good condition each year. Design may be too busy for some people. The TAG Heuer Formula I CAH101A.BA0860 watch is priced at $1,700 USD.